As the first fully-digital generation enters the real estate market, integrating technology into the processes of buying and renting has become essential. With the majority of Gen Zers and Millennials choosing to rent over homeownership, the renting experience in particular has been in dire need of an upgrade. The days of browsing newspapers to find an apartment are long gone, and almost every rent-related task can now be done online through different apps and websites. The digitalization of the renting process makes for a faster and more efficient way of communicating for everyone involved without taking away from the humanity of its interactions. The driving force of this cross-industry trend toward digitalization is providing a better consumer experience, which is characterized by ease, convenience and connectivity. All the necessary resources for digital renters are either on their phones or just a click away. Their journeys from starting the apartment search to establishing a residence showcase the many benefits of the digital renting revolution. Since the public introduction of the internet, the “selling and renting” section of the newspaper has become all but obsolete. Now, if you want to rent an apartment, for example, all you have to do is Google your query concisely, like “apartments for rent in Las Vegas.” Browsing through thousands of apartments listed on specialized apartment search websites, such as RENTCafe, allows you to find verified and scam-free apartments. Besides minimizing risk, such platforms also use filters to enhance your chances of finding the apartment that best suits your needs. These are a great way to refine your search, as you can typically filter by area, property type, number of bedrooms, rent, amenities, pet restrictions and more. You can also look at pictures and even take virtual tours of the various properties before applying for a specific apartment. If you can’t afford to rent alone but don’t have any acquaintances who can move in with you, there are many apps and websites specifically designed for finding roommates, such as Roomi and SpareRoom. These offer a lot of options, the most important (arguably) being background checks. You want to make sure your potential future roommate is a safe choice, so the fact that every profile is verified is a big plus. Some apps even give you the option to personalize your search to find your best match. Most apartment listing websites offer the opportunity to apply online and/or contact the property. Application forms are slowly becoming standardized, so the required information can be sent all at once. You can also upload or send documents without the usual hassle, because some websites allow you to communicate directly with the property manager. However, the online environment is not always secure, so make sure to only use trustworthy platforms and remain aware of scams. The advantage of applying for an apartment online lies in the clarity and transparency of the process for both the applicant and the landlord. Certain properties also allow tenants to electronically sign the required documents with tools like DocuSign. This not only makes transactions faster, but it’s also a completely secure method of signing the documents. All the transactions and agreements will be saved, and both you and your landlord can access it at any time. Renters’ insurance is essential, being the only way to protect yourself should anything unexpected happen, be that natural disasters or even just an accident. It’s one of the most affordable types of insurance, and the costs are very low compared to what you would have to pay if you had to cover the damages yourself. 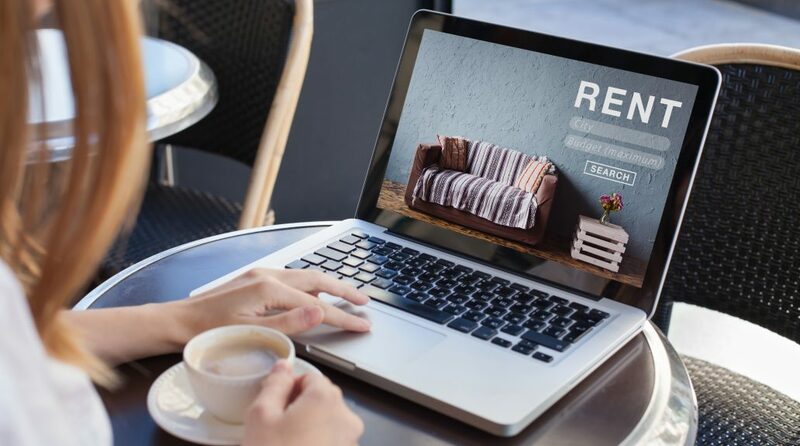 Online platforms such as ResidentShield make applying for renters’ insurance nearly effortless by offering a tool to calculate how much coverage and what type of insurance you need. You can apply, select the plan that best suits you and make your payments all online. Make sure the platform is secure and verified and buy yourself some peace of mind. Anyone who’s ever moved will tell you that it’s a tiresome process. Unfortunately, until we perfect teleportation, you still have to do the heavy lifting. Fortunately, there are various moving apps such as Unpakt to ease your pain. These will help you find the best deal by creating a virtual inventory of what you have to move and connecting you with your movers. It’s a small price to pay for the convenience they can afford you. Once you’ve chosen an apartment to rent through a specialized website, you will gain access to a resident’s portal. This is the ultimate tool to make any renter’s life easier. On such platforms, you can securely make rent payments or set up automatic payments so you will never be late on your rent again. You can view your transaction history and check your balance at any time. Another great feature is the ability to submit maintenance requests 24/7. There are a number of other benefits of these platforms, such as becoming more engaged in the community by using calendars that alert you to events happening in your neighborhood. All announcements are sent through the platform, so there is complete transparency and efficient communication between the renter and the property manager or landlord. You can contact leasing specialists or call to request assistance with any issues you might have in your home. Embracing technology and becoming a digital renter provides countless advantages, not the least of which is time-efficiency. Advancements in technology cut down on time spent waiting in line to pay rent, talking on the phone with maintenance or viewing dozens of apartments in person before making a decision. It’s easier, more convenient and more transparent at every step, and it’s ultimately the natural evolution of transactional processes such as renting. Mihaela Buzec is a passionate reader and writer, with an affinity for language and linguistics, as well as the latest technological developments. She discovered her passion for real estate at RENTCafé, and you can read more of her articles on their blog. You can get in touch with Mihaela at media@rentcafe.com.